When I was a kid, in the 80’s, pictures of the future always had flying cars and jetpacks, and movies that went there had amazing tech like ghostbusting proton packs, floating land speeders and hoverboards. 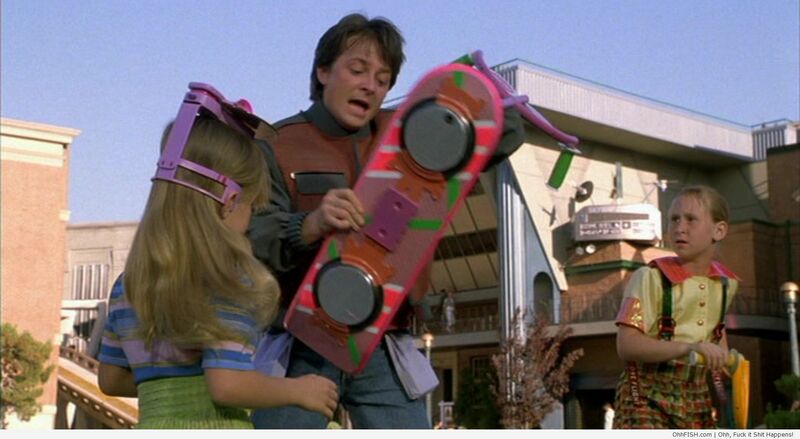 The hoverboard was a future re-imagining of the skateboard by the Back to the Future franchise. How cool would it be to float above the ground rather than rolling over it on noisy trucks? Although that was intended as a hypothetical question, let me answer it anyway: “Very effing cool!” Apparently we weren’t the only ones who thought so as the Funny or Die channel cashed in on our desire to live in the future by selling the idea that Hoverboards were now real in order to make their latest videos go viral. 12 million views in a week and a day! Impressive stuff. They got a lot of things right. First they were selling us an idea just about everyone of a certain age wanted to be true, and if you want to believe it’s true, you let yourself believe (it’s the basis upon which most religions are founded). Secondly, they weren’t cheap on the effects. Flying on wires and then rotoscoping them out is not rocket science, but they did it well and that costs money. Third: the celebrity endorsements. Having Christopher Lloyd (arriving in a DeLorean no less) to deliver the prototype; Tony Hawk demoing how it should be done; king-geek-Moby (along with other athletes and entertainment stars) showing that anyone could ride one. They had a pretty decent website for the product launch. They got so many things right, and people so wanted to believe, that many without an understanding of fundamental physics (most Americans) fell for it. There were a lot of tells if you were looking for them: the opening disclaimer “The following demonstrations are completely real” really should have been a warning. The fact that the ‘real’ hoverboard looked exactly like the original prop from the movie: movies can foreshadow tech innovations but the pulse rifle looks something like modern military weapons and the PADD from Star Trek (TNG) looks something like an iPad, not a exact precursor. If you have even a passing interest in science you’d know that there’s been no massive breakthrough in innovation to allow the hoverboard to be real, and if such a breakthrough were to happen, it’s first application would be expensive and not a toy. Beyond the question of whether you were gullible to fall for it or not, is another, potentially more interesting question, about what were they try to sell? Funny or Dies’s rapid apology for lying about hoverboards seems less that they’re sorry for fooling millions of kids (and kids at heart) and more that they’re sorry the truth was discovered so quickly. Web speculation is that this was a marketing vehicle for a new Back to the Future movie or Tony Hawk video game. While 12 million views is not to be sneezed at, this production obviously cost something to make. Celebrities like to be involved in a funny viral video but they also like to be paid too. Someone had to foot the bill: so what were they really selling? I really wish it were hoverboards but I’m sure the truth is much more mundane.